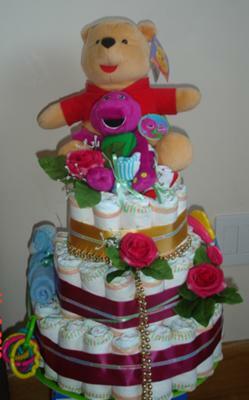 This fun diaper cake comes to us all the way from Ireland! It is so colorful and cheerful! I really like the different colored ribbons that Feyi used to coordinate with Winnie the Pooh colors. And all her adornments and cake toppers give it a really fun feel! Our readers come from all over the world and we love to see diaper cake and baby shower ideas from creative women from different countries and cultures. Feyi has taken of her own time and efforts to submit her darling ideas and tips to share with others. That is what makes this website valuable and unique - because of helpful contributors like Feyi. Thanks so much Feyi, for sharing your creative ideas! Made this for a very good friend. We don't know yet if it's a boy or a girl so I had to make something that'll suit either. I used a round bottle gift box as the centrepiece. I rolled up a lovely pyjamas to fit into it and added a rose flower for my friend. I used about 72 size-3 Huggies Nappies, a plastic tray with smiley face design as the base. 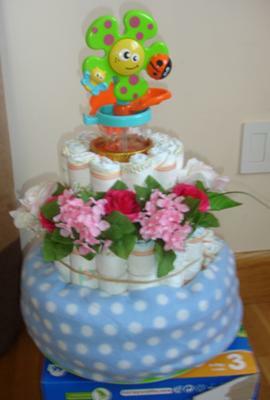 For the First tier, I used the nappies as they are to make circles around the bottle gift box for the inner part and then rolled up some nappies for outermost part. Personally, for hygiene purpose, I prefer to roll-up the nappies as they are as opposed to opening them up. Its a little bulkier but should be held tight with rubber band to reduce the bulkiness. For the 2nd & 3rd tier, I rolled up all the nappies for to make the two circles, securing them all with a rubber bands on the centrepiece. I placed the Winnie the Pooh & Barney on the top of the centrepiece and used rubber bands to secure them. I have used plain wine & gold ribbons lined with a smaller ribbon with ''congratulations'' printed on it. I used a plain green ribbon to tie the other gifts...rattles, teether e.t.c to the second layer. I finished it by adding three silk rose flowers and gold bead (from my xmas decorations)...and Voila..a diaper cake. Everybody loved it at the baby shower and most importantly my friend loves it. Wishing her a safe delivery in September and we pray its a BOY. This is such a fantastic idea. I will definitely be sending these lovely 'cakes' to my pregnant friends. These will also add glamour and fun to any baby shower. Thank you so much for posting this. 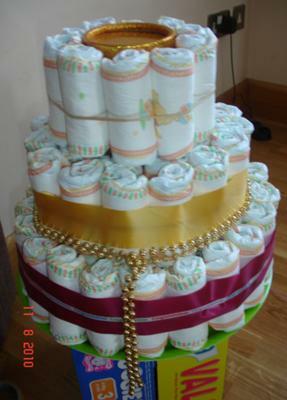 I have included Diaper Cakes into my business. We offer deliveries for people abroad to their loved ones here in Ireland. Please do send a detailed message by clicking on the the ''customer service'' option on www.partylink.ie. I look forward to hearing from you. Thank you.